Photo by Jesus Sepulveda – Buchanan poses in front of their newest hardware after their third consecutive Valley title. The state’s No. 9 ranked team now has their sights set on a state championship. Jacob Rudolph liked the result so much the first time he thought he might as well try it again. Receiving a pass on the left hand side and tapping it ahead and slight right for a better angle, the junior forward fired a perfect 22-yard strike in the upper right hand corner of the net just 5:45 into the D-1 Valley championship game for a 1-0 Buchanan lead over Bakersfield-Centennial. 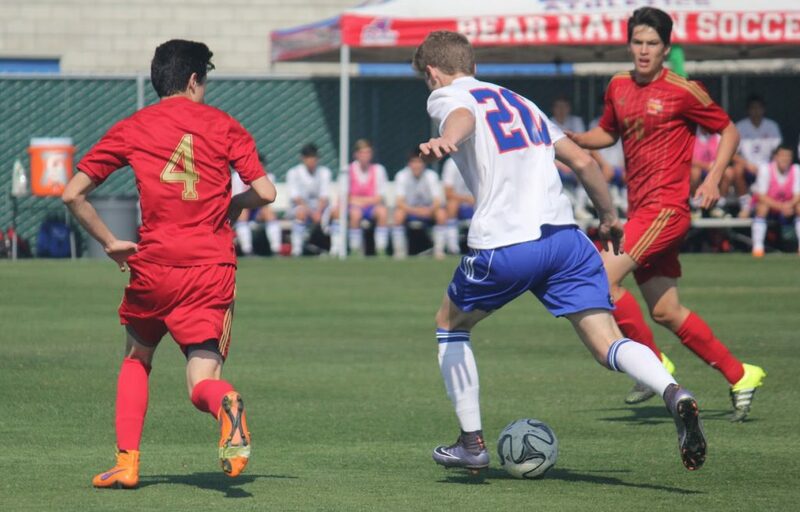 Buchanan star Jacob Rudolph lines up his first goal of the game just two minutes into the D-1 Valley title game won by the Bears over Centennial-Bakersfield 2-0. Rudolph scored both goals in the game. But Rudolph wasn’t done. Around seven minutes later, he did it again, certainly a moment in which the Yankees great linguist Yogi Berra would have uttered his famous catch-phrase, and right as rain, Rudolph put that ball in the exact same part of the net from two yards behind his first. And with that mighty laser, the shock and awe of Buchanan was on full display. This was the perfect start for the Bears—the No. 9 team in the state and ranked nationally by topdrawersoccer.com—and it was exactly what the Hawks were afraid of. It was all the Bears (20-1-7) needed as they rolled to a third consecutive D-1 Central Section championship. Centennial coach Jeff Vaughan knew that was a bad omen. Now facing a 0-2 deficit, and facing a stout Buchanan defense gunning for its 17th shutout of the season, it was tough sledding for Centennial, who actually led the D-1 Central Section with 65 goals coming into the game. According to Spurgeon, the Bears had 26 shot opportunities compared to five for the Hawks for the entire game. And what about that impenetrable defense, the team that allowed two goals total in their last six games? Simply awesome says Spurgeon, who has been witness to the Bears five Section titles in the past six years. 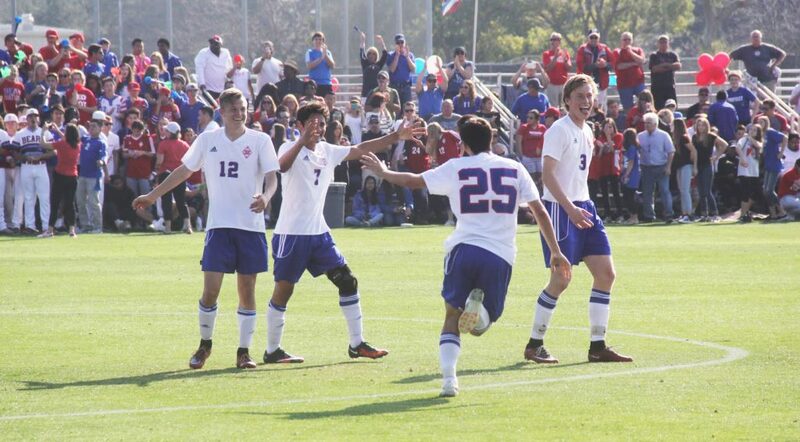 Four members of the Buchanan D-1 title-winning team celebrate after the final whistle of the D-1 championship game. “When you are as good as we are defensively, a one goal lead really helps,” said Spurgeon. And two is twice as nice and at least this day belonged to Rudolph, the 6-foot-1, 165-pound striker who’s being looked at by UC Davis. The Bears were awarded the No. 3 seed in the state playoffs and hosted Los Alamitos on Tuesday, March 8.